The Matsuyama Castle, one of the 12 original surviving Japanese castles, was owned, before the Meiji Restauration, by the Matsudaira clan, a branch of the family related the the Tokugawa shogun. The castle’s main tower, photographed here, dates from 1820, because the older tower was destroyed by lightning. 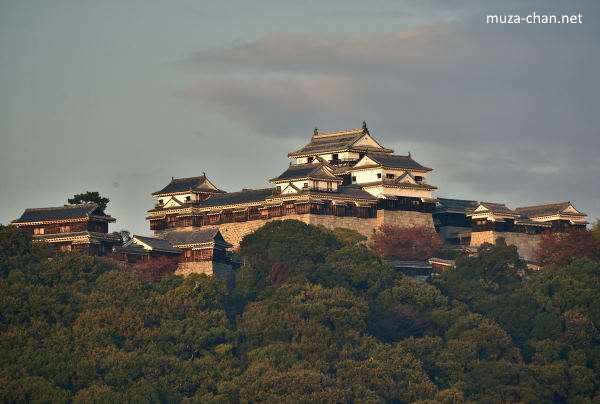 Some of the surrounding buildings were destroyed by the bombings at the end of the WWII, but they were rebuilt during the 1960s-1980s, and now the Matsuyama Castle is one of the most complex castles in Japan.